Today, when you order "Black Water Clear Water (Full Size)", you'll instantly be emailed a Penguin Magic gift certificate. You can spend it on anything you like at Penguin, just like cash. Just complete your order as normal, and within seconds you'll get an email with your gift certificate. This is an awesome addition to Sands of the Desert. 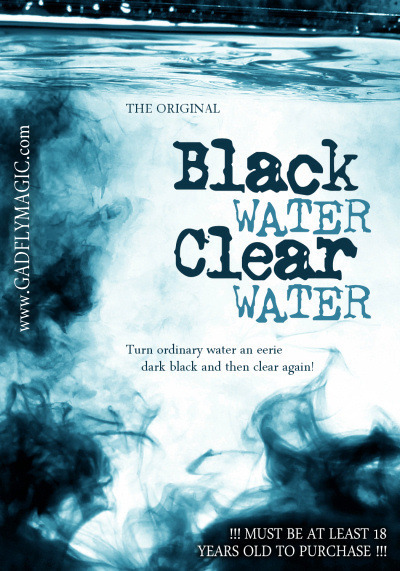 Black Water Clear Water instantly shows your audience a beautiful display of magic! NEED MORE? Get the Black Water Clear Water DOUBLE PACK! Works well. I need to play with the ratios. Loading final chemical is great for timing your finale. Maybe dissolvo paper. Not sure it adds much to "Sands..." but it is a nice variation.